Enjoy nature's wondrous pleasures in this sprawling, western-style ranch. Enjoy nature's wondrous pleasures in this sprawling, western-style ranch. Designed for entertaining both large groups and intimate gatherings, the spacious kitchen and hearth room tie together seamlessly with the dining and impressive great room. Passing through a glass-filled solarium with planters, the luxurious master suite houses a grand walk-in closet, spa-style bath, private laundry and canopy porch. Three secluded bedroom suites, all with individual baths, are accessed through a barrel-vault hall. 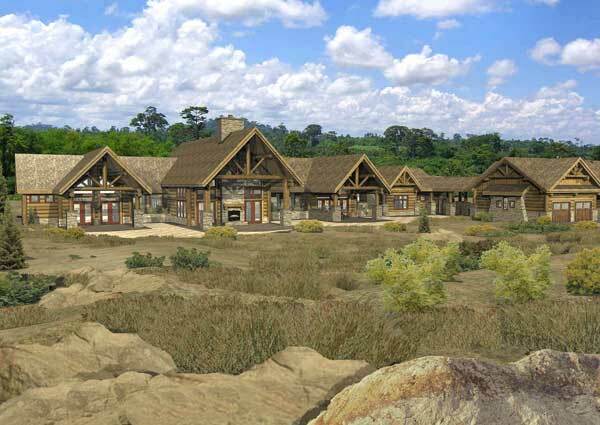 Inspired by an experienced outfitter, the optional lower level is equipped with a shooting range, gun cleaning center, trophy gallery, exercise room and sauna.